Last week, my fiance and I went hiking at Mary’s Peak, a 6-mile there and back hike outside of Corvallis. This was our first hike of the summer, and our first hike with our five-month-old Border Collie mix, Magnus. I was ecstatic to be taking Magnus on his first hike. 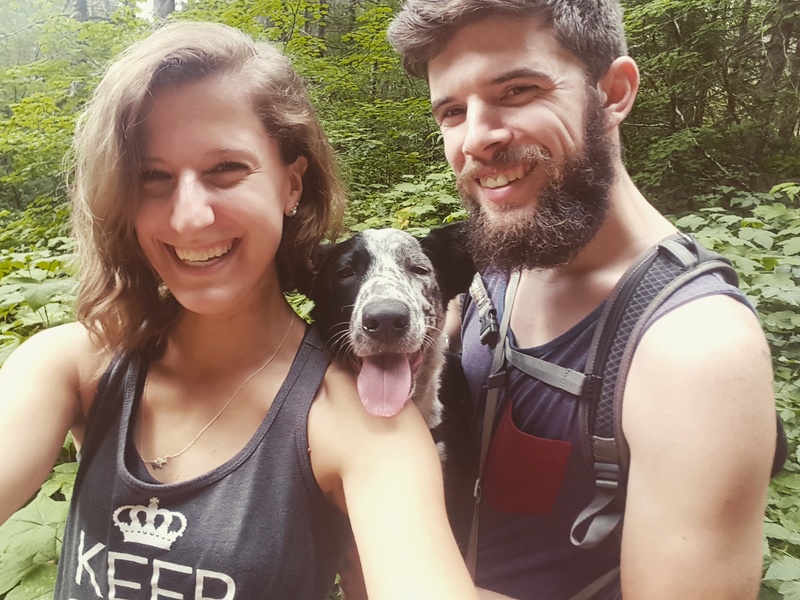 When my fiance, Nolan, and I were deciding on which kind of a dog we wanted back before we got Magnus, we knew we wanted a dog who could go hiking and backpacking and climbing with us, a dog who would easily fit in with our active lifestyle. And now we were putting that notion to the test. The day started out overcast and muggy. As we trudged up the trail, kicking loose clumps of dirt and rocks up with our heavy hiking boots, it grew hotter. Because he’s a five-month old puppy, Magnus has a tendency to pull on the leash excitedly, his little black nose wiggling furiously as he sniffs his world in earnest. 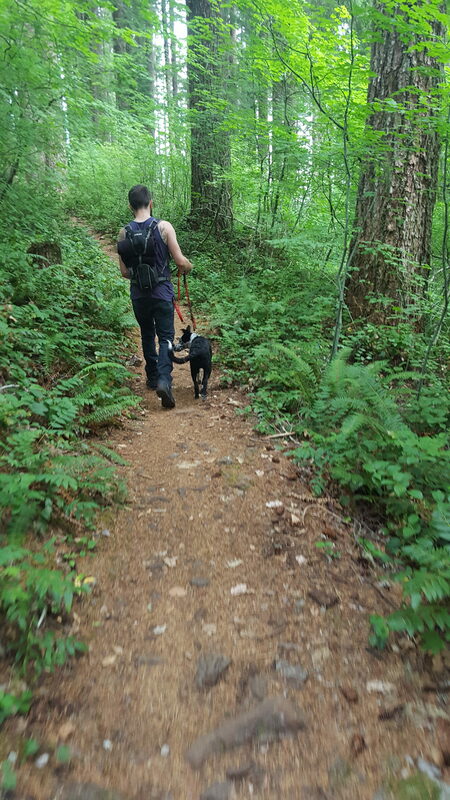 But on this hike, he stayed by my fiance’s side the whole time, sniffing everything, of course, and yanking off bits of ferns that inundated the landscape on either sides of the trail, and chewing on small rocks. He had a blast. Magnus trotted up and down the whole hike without ever slowing down. Nolan and I were hot and sore but he never showed any indication of tiring – minus his fat, pink tongue lolling on the side of his mouth. When we got home, he lapped up more water than I think I’ve seen him drink, then laid down on his rug and passed out. Nolan and I laid on the couch and dozed off too. It was a successful hike. 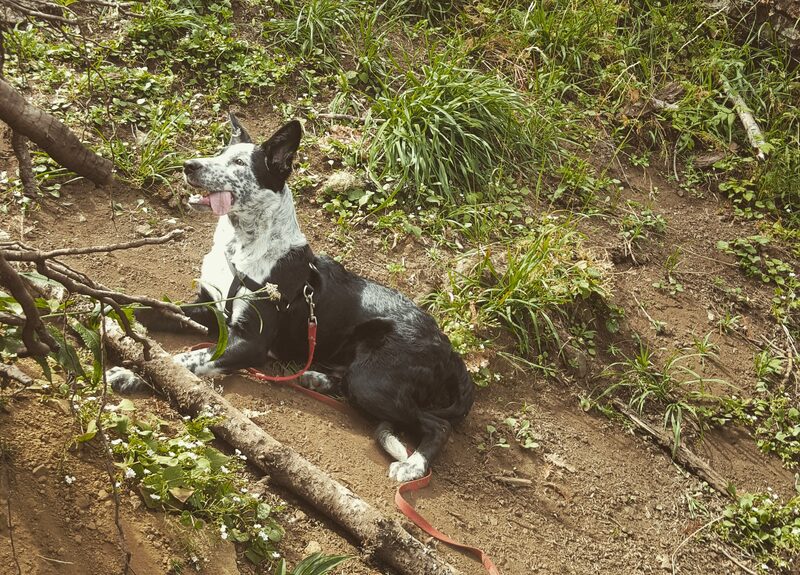 Magnus is the perfect hiking dog and I cannot wait to take him on more. Photos: (top) Magnus lies in the packed dirt and watches his dad, who was leaping up a giant log that had fallen off the side of the trail. His huge tongue hangs out the side of his mouth. (left) Magnus and Nolan walk down the trail together, side by side, with a copse of tall, reaching trees around them. The foliage and leaves are a rich green, leaving me feeling like this bit of land remains untouched by the toxins and chemicals choking us in the city. Many of the trees surrounding the trails of Mary’s Peak are new growth emerging from the ashes of past fires. (middle) Family portrait. Nolan, my fiance, rarely smiles in photos I take of him – he thinks it’s funny to make weird faces. But I told him he needed to smile for this one, and he did. Magnus is even smiling! 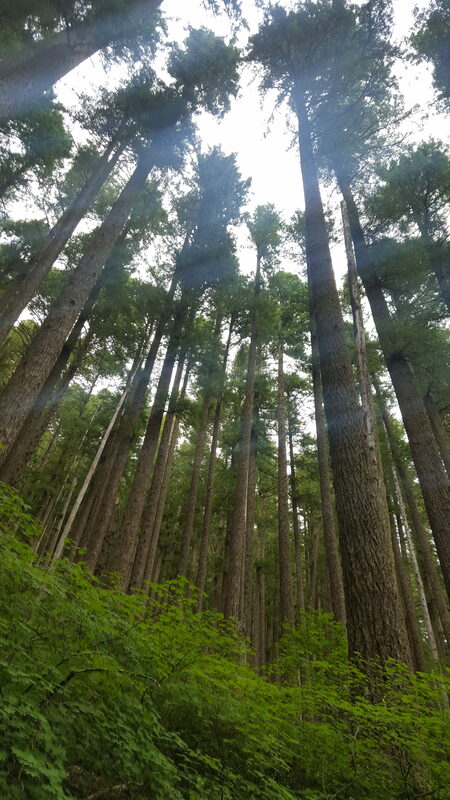 (right) More of the dense trees that populate Mary’s Peak.